Summertime is the perfect time for getting in shape and eating healthier. Often times I get so hot in the summer that I don’t feel like eating or I starve all day long and then end up going crazy eating like a mad woman at 10 PM which is not good for you at all. I try to keep the toppings on a salad down so that I don’t rack up too many calories but every once in a while I splurge and have the Where is The Sink Salad! Try it….I guarantee your going to love it! 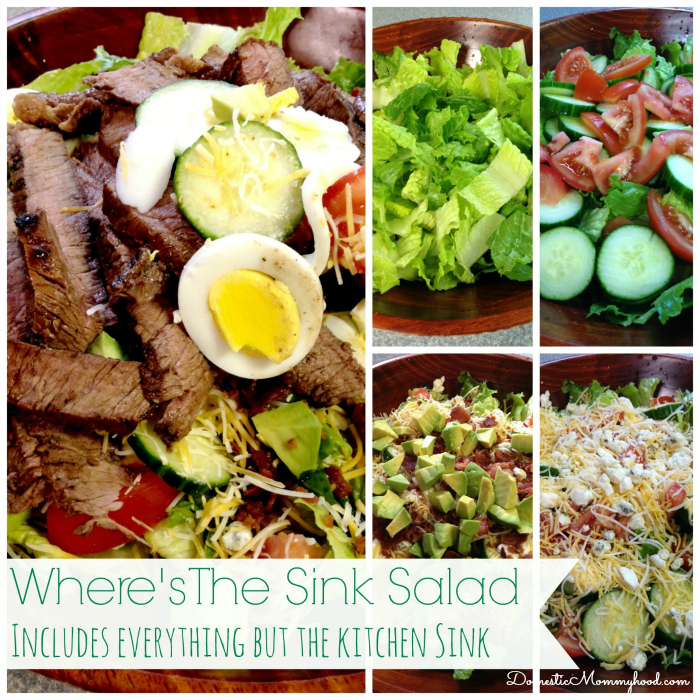 If you are a salad junkie, you will love this Where’s the Sink salad. Where does it get its name you ask? Well, it includes just about everything but the kitchen sink! Take a look at how to make your own, as it makes the perfect summer meal all by itself! Begin by preparing your steak. To do this, rinse the piece of meat under warm water and season it generously. To season it, you want to make a dry rub using the seasoning salt, garlic powder, and salt and pepper to taste. Sprinkle the dry mix onto each side of the meat. Cook the steak on the grill on high heat for 5-7 minutes on each side or until cooked medium. If you wish, you can cook the steak on a stove top. Just place it in a pan with a teaspoon of butter and cook on high for 7-8 minutes on each side. Flank is typically a thin cut of meat, so you do not need to cook it long for it to cook through. the steak rest for 7-10 minutes. Start slicing it at an angle into thin strips. Set aside. You can now prepare your salad. Rinse and chop your romaine hearts. Place them in a large bowl. Start layering the ingredients. You can begin with the cucumbers and tomatoes, followed by the eggs and avocado. Finish with the variety of cheeses and bacon crumbles. Add the steak last, laying it in strips on the top of the salad. Top the entire salad with an additional sprinkling of salt and pepper. This Where is the Sink Salad can be served with the dressing of your choice or eaten as is. There are so many flavors in it already you don’t have to do much else to dress it up! Give this salad a try the next time you want to try something different yet satisfying! Hello Bekki! I’ve nom­i­nated you for a Lieb­ster Award. It’s an award that blog­gers pass on to each other so we can get to know each other and so our read­ers can get to know us a lit­tle bet­ter too! You can check it out on my blog. This looks like an amazing salad that my husband would love! He loves steak and veggies, so this would be a perfect quick meal for us! You may have created the perfect salad with this one! Love it. Thank you for linking at the In and Out of the Kitchen Link Party. Hope to see you again next week. Healthy way to eat more fresh food….